This car is from the personal collection of Barret-Jackson president Steve Davis. For auction company Barrett-Jackson, the recent Las Vegas mass shooting hit close to home. At an upcoming auction scheduled for October 19-21 at the Mandalay Bay resort, the location of the Vegas shooter, a very special car will be auctioned off with the entire sale price (or “hammer price”) being donated to a fund for Las Vegas first responders. 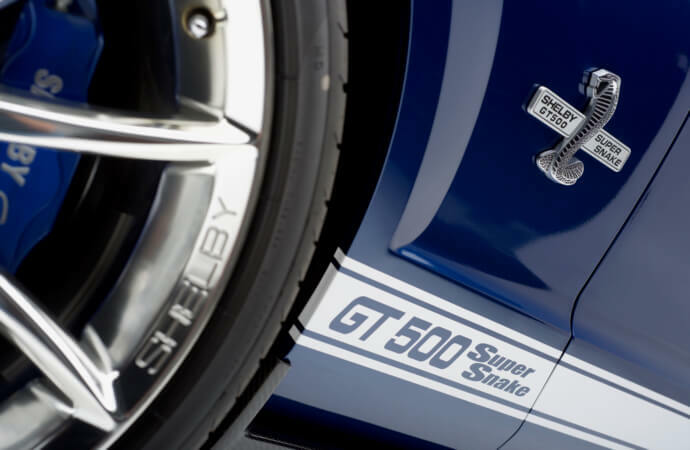 The car is a 2007 Ford Shelby GT500 Super Snake 40th Anniversary Edition which is being donated by Barrett-Jackson president Steve Davis from his personal collection. The car’s original owner was former Ford CEO Mark Fields and it was the seventh Shelby GT500 built that year which makes it one of the first GT500 models built since 1970. It was converted into a Super Snake by Las Vegas-based Shelby American (Shelby Automobiles at the time) under the supervision of Carroll Shelby himself with his autograph on the car to prove it. This Super Snake also comes with a special book documenting the car signed by Shelby. The Super Snake option brings the power rating of this Mustang’s 5.4-liter Modular V-8 engine up to 605 along with a fiberglass ram-air hood, carbon fiber front splitter and skirts, six-piston Baer brakes, upgraded suspension, an aluminum driveshaft, a 3.73 differential, cat-back exhaust, and of course, an appearance package with lots of Shelby badging. This isn’t the only thing Barrett-Jackson is doing to benefit those affected by the Las Vegas shooting. It’s also arranging on-site donation opportunities and offering two free tickets for the auction to first responders who show proper identification at the Mandalay Bay box office. If you’re interested in the car, it will be sold at approximately 1:30 pm on Saturday, October 21. If you want to see how much the car goes for, you can watch the auction live on the Discovery Channel.